That’s what WPHL, the MyNetworkTV affiliate in Philadelphia, did this February/March. With a limited budget, and using just one image spot for 80% of the time, the station’s 10 p.m. news achieved the No. 1 spot for four nights during the campaign, the first time it’s done so in years. And it didn’t use outside TV or radio or any other out-of-home media except digital. Prior to the February 2014 ratings period, WPHL was consistently the No. 2-rated 10 p.m. newscast by a large margin. (WPVI, the ABC Owned station in Philadelphia, produces Action News at 10 on PHL17 from the 6abc studios every night. The newscast utilizes WPVI talent and staff to report and produce nightly on PHL17. The Monday through Friday on-air team consists of Brian Taff, Shirleen Allicot, Adam Joseph, and Ducis Rodgers). So during the last week of the February sweeps and for several weeks after, WPHL, based on recommendations from Mixpo, a multiscreen video ad solutions company, spent its limited media budget entirely on digital media featuring interactive in-banner and in-stream videos. 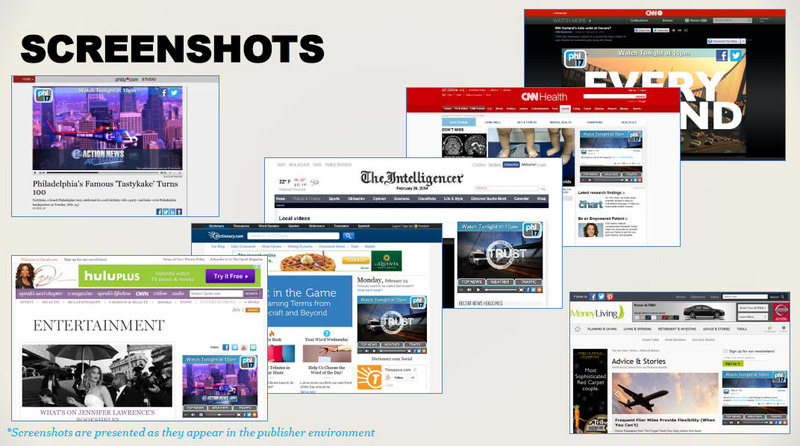 The ads appeared across 250 different sites ranging from national ones like CNN.com, MSN.com, Biography.com, Hulu and WebMD.com to local news sites like Philly.com, BuckscountyCourierTimes.com, and BurlingtonCountyTimes.com. According to Brower, WPHL’s 10 p.m. news was No. 1 in adults 25-54 on four nights during that time period and was No. 1 in households on six nights. “We have partnered with Mixpo for seven different sweeps periods,” said Brower, “and they have consistently helped us grow our ratings.” Brower cited Mixpo’s geo-targeting capabilities as one of the reasons for the campaign’s success. The station made a conscious decision to go with an image spot promoting the station’s snow coverage as “there was a lot of winter weather going on and the spot reinforced the creative already running on WPHL,” said Brower.